- 1-Channel dosing 3 mL/hr. up to 850 mL/hr. High Volume One Channel System. The Admiral can also be used as a one-channel makeup water doser. Using the included high volume tubing set, the Admiral will pump up to 850mL per hour, or up to 5 gallons per day. 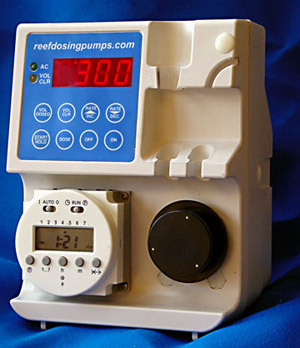 Timer/Controller Interface - Using the optional Timer/Controller Interface, the Admiral can easily be controlled by other devices, such as pH controllers, electronic float switches or aquarium monitoring systems. The Admiral will utilize liquid from containers 3 feet below pump and will pump vertically at least 15 ft.
Purchase of the Admiral includes single-channel 850 mL/hour tubing set as well as the 0.15 – 85 mL/hour 2-channel dosing system. Exceptional Accuracy and Tubing Life Utilizing a heavy-duty, Swiss-made motor and precision gear drive system,The Admiral pumps at a constant rotor speed of 12 rpm when set at 300. For slower rates, the timing cycle is changed but the rotor speed remains constant. Since it doesn't rely on friction to drive the pumping mechanism, the output of the pump will remain stable over very long periods of time. Also, since the rotor moves at such a slow speed, tubing life is significantly better than that of higher-speed, gearless pumping systems. Guarantee- The Admiral is guaranteed against mechanical or electronic defects for one year, both parts and labor. Damage by moisture or customer abuse of the equipment is not covered.